For the best results buy good quality rice. Cheap rice will often give you stodgy results. 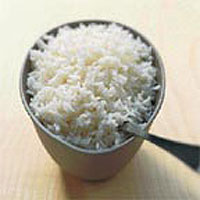 Basmati rice has more flavour than long grain so is particularly good to serve with spicy or highly flavoured foods. Plain long grain rice is often served with Chinese food to provide a neutral base that will soak up other flavours. Easy cook rice is partly steamed rice which cooks quicker than regular rice, but the flavour is not as good as quality long grain or basmati. Weigh the rice and tip into a sieve. Wash the rice under running cold water until it runs clear. This will rinse off excess starch to ensure that the cooked rice is not sticky. Shake off the water and tip the rice into a medium-sized saucepan. Add half a teaspoon of salt and 600ml cold water. Bring to the boil, then give the rice a stir and reduce the heat. Cover with the lid and cook for 10 minutes. Take a look at the rice. The water should have been absorbed. If it is not, cover again and cook for a further 2-3 minutes. Turn off the heat and leave the rice, covered, for 5 minutes. This will drive off any excess moisture to ensure the grains are fluffy and separate. Follow paragraph 1 of the instructions, then tip the rice, salt and water into a microwave-proof bowl (a Pyrex bowl is fine). Cover tightly with microwavable film and pierce this three or four times with a sharp pointed knife. Cook on high for 5 minutes, then on defrost for 10-12 minutes. The rice will stay hot for up to 15 minutes if you keep it covered with the film. Saffron - for rich, golden rice add a pinch of saffron threads with the water at the beginning of the cooking time. Tomato - add a tablespoon of tomato purée with the water and stir well to dissolve it. Coriander - stir 2-3 tablespoons of roughly-chopped fresh coriander leaves into the cooked rice.